Amazing Golf Course View on Cul-de-sac lot with Upgrades Galore Including Hardwood Floors, Crown Molding, Quartz Counters and More! Desirable eat-in-kitchen is featured in the island kitchen with pendant lighting, gas range and oven, stainless appliances, and quartz counters. 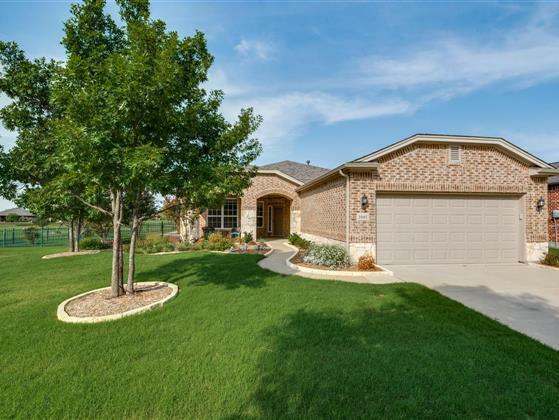 Spacious family room with gorgeous hardwoods and crown molding overlooks the large wrap-around stamped-concrete patio with pergola. Fully fenced yard is surrounded by a greenbelt and golf course. Study with french doors overlooks that same lovely backyard view. Master suite offers hardwood floors, quartz counters, garden tub, separate tiled shower and walk-in closet. Utility room with sink. Epoxy-coated garage floor. Zero-fee loans available on this listing.